ARCHOS has unveiled its next generation PCtablet which named as ARCHOS 9 PCtablet. The new PCtablet has been combining the performance of a high-end PC with breathtaking design, excellent ergonomics and astonishing touch interface. The ultra portable PC has been enhanced with a full touch-sensitive 9-inch screen for users to enjoy a comfortable computing experience. Powered by new Z515 Intel processor and runs on Microsoft Windows 7 operating system, ARCHOS 9 is also integrated with multimedia platform that uses WiFi 802.11b/g connection and Bluetooth 2.1 for extremely fast computing anywhere. It boasts a resistive screen that allows emails and documents to be composed easily via a built-in virtual keyboard, and supports innovative optical trackball and buttons for easy navigation on screen. Besides that, it also includes Microsoft Office, Web TV & Radio, video conference, anti-virus, parental control, photos and movies edition applications. 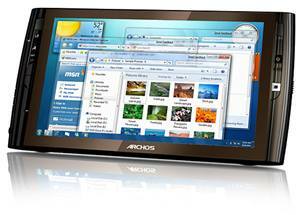 The ARCHOS 9 PCtablet with 0.6-inch thin and weighs less than 22.29 oz is expected to be available in this fall 2009.